There are just a few Subordinate Granges left to evaluate and the reports are pretty good. From what I have read the Granges have taken in more than sixty new members this past year. This is very encouraging and I hope it will continue into the fall. I would have liked to see more joining Pomona Granges and I am sure I will see this in October. I commend all Granges for doing their best during the evaluations. Specifically those that made the extra effort and put on degrees or had special programs to attract new members. I am sure that some of the plans we put into operation will reap benefits in the coming months. Since this article covers July and August I will get right to the meat of it. The most important item is the National Session. There are many odd jobs left to fill and some are not on my mind right now. Those of you who have already been assigned a job need not be concerned now. Those of you who have not will be contacted soon. It would be helpful if you could contact Jody Cameron (Convention Coord.) at jodycameron2000@sbcglobal.net or at (860) 564-7614 to let us know which days you will be attending the session so he can fit you to a particular job. Also it will help just knowing when you will be there in case a last minute position has to be filled. The excitement is building and I can feel that this is going to be a great event for the Northeast Region. Let us not forget the mundane work that must continue before then. There are several events of importance that are on the calendar for these two months. Those that stand out the most are “Let’s Celebrate” and the Northeast Regional Lecturer’s Conference. The details of these events are available inside this issue. We should do our best to support both of them. Besides they are enjoyable events. Bring some non Grange friends to Lets Celebrate. They will learn about the Grange and have fun at the same time. Going into September we have the Big E. I know many of you are making items for the National Session but I hope you are still making some for the CWA at the New England Grange Building. I hope you will also spend some time working in the building during the fair. The fair has been a big success the last two years and the Big E Trustees have gone out of their way to make this year even greater. Sister Doris Shaw will be contacting many of you soon to man the Connecticut Room in the building. Please volunteer and also help out in the store. This building is a great place to educate people about the Grange. 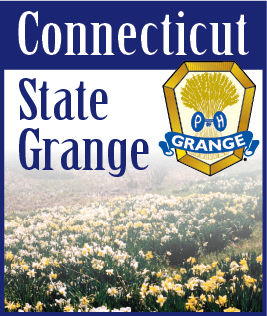 The more we educate people about the Grange the easier it will be to build our Order. Sister Marge and I hope you enjoy the free time you have left this summer and I will still be going around visiting your Granges.